The Washington Monument is an obelisk on the National Mall in Washington, D.C., built to commemorate George Washington (1732-1799), once commander-in-chief of the early Continental Army and the first president of the United States of America. He exemplified the core ideals of the American Revolution and the new nation: republican virtue and devotion to civic duty. Completed in 1884, the monument, constructed of marble, granite, and bluestone gneiss, is the tallest stone structure in the world, standing at 555’ 5 1/8” tall (169.294 m). It was the tallest structure in the world until 1889 when the Eiffel Tower was completed in Paris, France. This sculpture, created entirely from 4128 official LEGO® pieces, faithfully reproduces the elegance of this incredibly impressive and instantly recognizable monument. The completed scale (1:131) of the sculpture captures the awesome presence of the real monument. 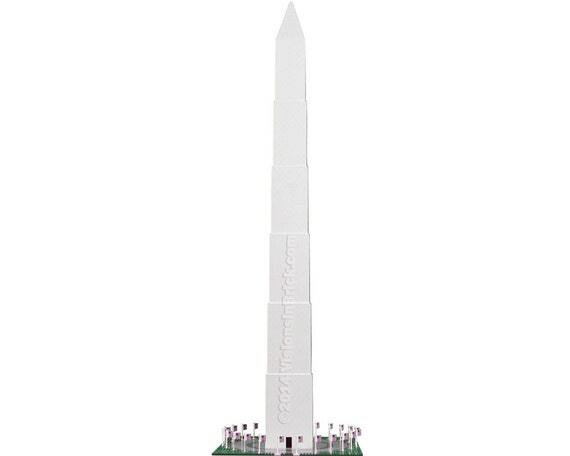 The Washington Monument is deceptively difficult to design to proper scale with available LEGO® pieces while also capturing the graceful angles of the obelisk sides and top pyramid. By gradually stepping-in the sides of the monument, the completed sculpture is able to very closely capture the 88.8 degree angle of the sides and the 72.6 degree slope of the top pyramid. As part of design modifications in 1876, the monument entrance was modified as shown in the model. Today the entrance is covered by a temporary visitor screening center, erected in 2001. 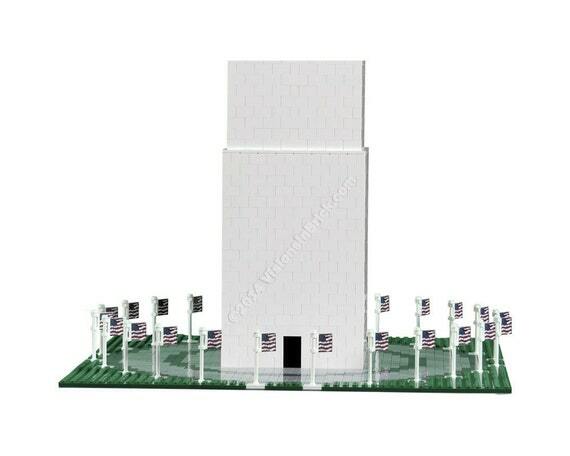 The screening center was omitted from the design to better capture the look of the original monument. Today the monument is situated in the center of five concentric rings of light and dark circular stone pavers. While capturing all the stone rings to scale would create too large of a display footprint, the first three rings were accurately captured to scale. 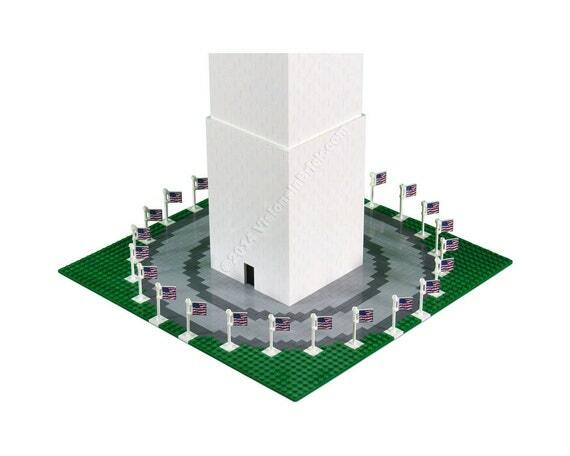 The modern monument is also ringed by 56 flags (one for each state and U.S. territory), but due to the designed scale only 24 flags are used to capture the effect. Typically many LEGO® models are designed “studded” in appearance. 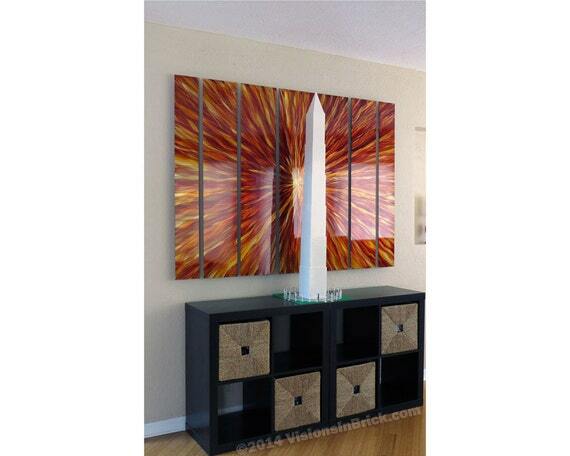 However, this particular model was designed to eliminate the appearance of LEGO® piece studs. This “stud-less” look adds an incredible level of realism to the final model. Wow! The size of this MOC is amazing! Great job! Thanks WarSquirrel. 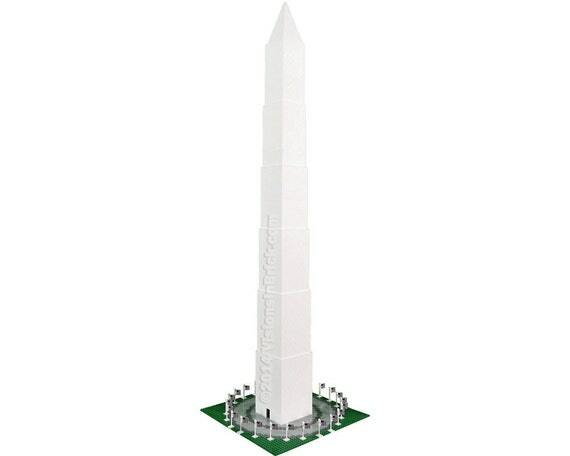 I eventually plan to do other Washington DC landmarks to a similar scale...well at least a scale that can be displayed in a normal indoor space and not a size found at LEGOLAND! I think I'll take a crack at the White House next.